Norway-based cleantech company, EnergyNest, is partnering with Italy’s Enel, to analyze the benefits and impacts of the integration of its technology into one of Enel’s power generation assets. According to EnergyNest, impressive economic and climate-relevant figures could be achieved with full-scale integration of the company’s latest thermal energy technology, including reduction of up to 45,000 tons of CO2 annually and project payback in less than three years. The collaboration launched with EnergyNest gives Enel the chance to evaluate the company’s thermal energy battery solution under real-life conditions. This will help Enel identify full-scale business-applications for the technology integrated into thermal power plants. 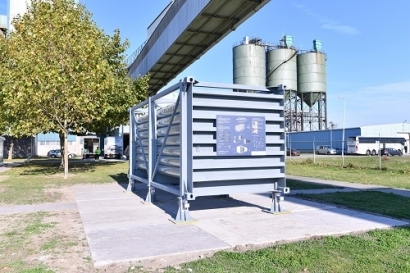 The objective of the project is to demonstrate how waste heat recovery in thermal energy storage can increase flexibility and sustainability of thermal power plants. This activity will allow Enel to assess technology robustness, its potential contribution to increasing efficiency and its positive environmental impact. EnergyNest recently unveiled its first thermal battery module, produced in its new manufacturing hub in Europoort, Rotterdam, on the site of partner Mebin. Manufacturing for two commercial projects is now expected to start at the end of the year. EnergyNest’s battery modules consist of locally-sourced, recyclable materials – framed steel pipes set with Heatcrete, a high-performance thermal-energy-storing concrete developed in partnership with HeidelbergCement, Germany’s multinational buildings material company.